The Plastic-Free Takeaways campaign team held their first stall at the Levenshulme market on Saturday the 24th of March. Ali, Lucie, Mirjam and Sébastien all arrived around 10am under a nice sunshine and Ian was an unexpected but appreciated addition to the group a bit later. 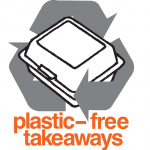 The aim was to engage with customers of the market for them to support the campaign by writing to their favourite takeaway and asking them to drop plastic packaging and switch to eco-friendly alternatives. The 100 leaflets/postcards that were printed have all been given away and filled in, with an overwhelming majority of people being enthusiastic about the campaign. Most stall holders at the market were also already using compostable packaging. This was all very encouraging ahead of a meeting with the market managers on the 28th of March and the next stall on the 14th of April. To cap a very positive day, Ali gave a lengthy interview to Sky News who were at the market for a piece on plastic packaging issues.